The market for luxury goods and services is driven by worldwide wealth. While difficult to monitor due to currency fluctuations, the U.S. distribution of wealth is still growing and skews toward the top 1% of the population, who own about 89% of our wealth. Increasing inequality also boosts the speed at which new millionaires are created, although wealth inequality is roughly unchanged since the start of the century. As with other industries, the fashion, cosmetic and fragrance industry is affected by advances in wealth. This natural evolution results in new desires, product choices, and marketing methods presenting unique frontiers for today’s entrepreneurs, product developers and marketers. Nicolas Bijan’s presentation will provide insight into some of the latest fashion and style trends in this segment. 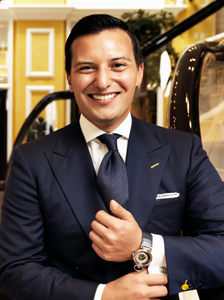 At age 16, Nicolas Bijan, son of Bijan Pakzad, Founder and Co-Owner of the iconic House of Bijan in Beverly Hills - the Rodeo Drive luxury menswear retailer, immersed himself in learning the subtleties of marketing to their discriminating consumer. The Bijan brand was established in 1976 and remains a recognizable mark of incomparable quality and style over forty years later. The brand’s loyal clientele include heads of state, royal families, captains of industry, and the Hollywood elite. While attending Pepperdine's Graziadio School of Business during the evenings, Nicolas worked in his father's luxury boutique during the day, eventually dropping out to work full time at Bijan. In 2008, he became Associate Merchandising Director responsible for brand management, merchandising, sales, marketing, and advertising. In 2011, after the death of his father, Nicolas took over responsibility for the Bijan brand with the company’s other Co-Founder, and has since worked to reinvent and expand Bijan for a new generation. As a result, company revenue has roughly doubled since then. The subtleties and challenges of marketing to this luxury segment will be shared, including information about Bijan’s Men’s and Women’s fragrances, the world’s most expensive fragrance brand.